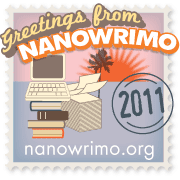 Today I started writing a novel as part of the 2011 NaNoWriMo challenge. This is my third 50,000 word novel, having written one last November in the 2010 NaNoWriMo, and another this July, in Camp NaNoWriMo. Unlike the previous stories, which I had been working on in my head for several years, I am now writing a story I only thought up recently. I was able to start outlining it before beginning to write, and plan to continue the outlining process as the writing proceeds, because I think planning ahead will help me write more easily. Without the pressure of making up the story as I go along, I should be able to focus on the writing itself as I write. I feel very optimistic about this project, which has many layers of complexity. I hope my writing experience in the two previous novels has prepared me well enough to do this story justice. I wish all the other NaNoWriMo participants the best of luck, and hope this challenge will benefit everyone who tries it. I hadn't realized you'd done this already twice before! Would love to hear more about it. Wishing you success with your latest effort.